Pink is her favorite color. So a pink party is what we had. Pink as in Sleeping Beauty pink. 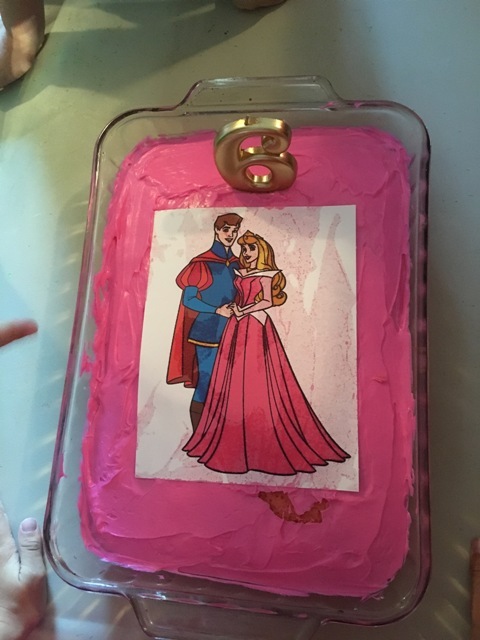 A Sleeping Beauty birthday party is all she talked about for months. She invented the menu herself, asking for “crown burgers” and strawberry cake with pink frosting. 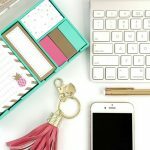 So I gathered my Pinterest ideas and my party planning printable and I put my creative juices to work. 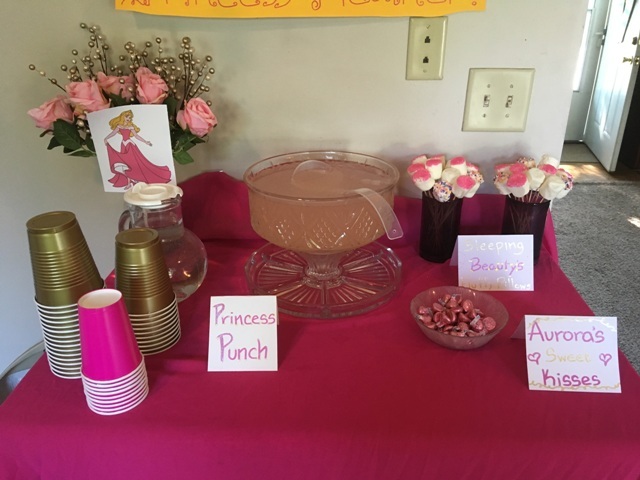 I’ve been planning princess parties for my daughters for years now so the system is almost routine, or at least it should be. 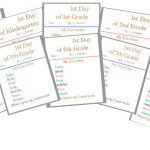 But It felt a little crazier this time, planning a party the same week as kindergarten was starting and a family wedding was happening. The same week that I was sick with an ongoing sinus infection. 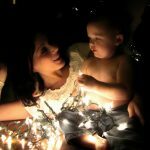 My first party with two children and an 8-month-old in the house. The list of obstacles could go on. But I muscled through the party prep with a whole lot of prayer and perhaps just a dose of anxiety and we made it through. 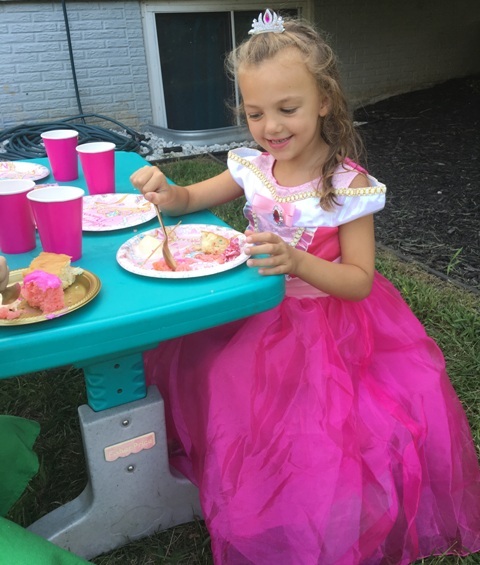 I would do it all again just to see my six-year-old’s joyful face and to hear her say as she blew out the candles: “My wish is that my Mom baked a nice strawberry cake for me.” It was so sweet and everyone laughed and it reminded me how much the little things we do for our children can mean to them. Like making a strawberry flavored cake from a box. 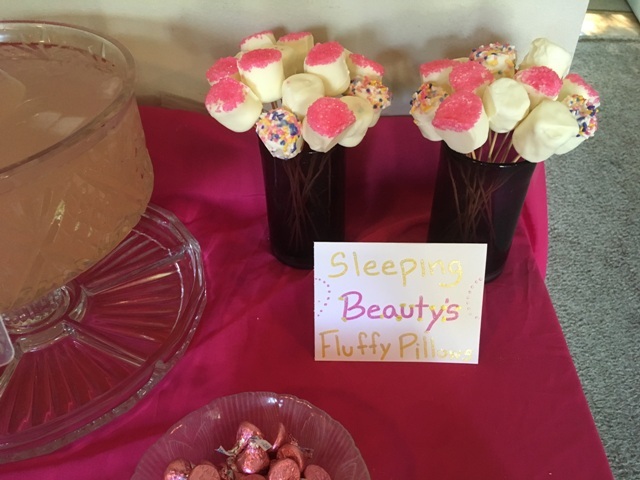 Not only did we have the pink strawberry cake of my daughter’s dreams but we had everything else a lovely Sleeping Beauty party needs. 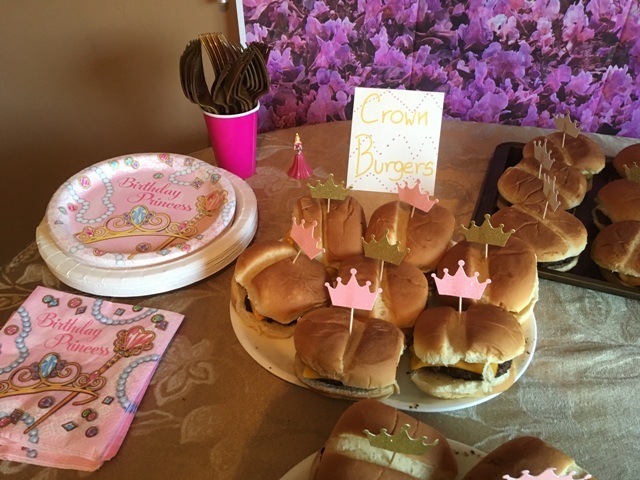 The crown burgers were there, grilled to perfection by Daddy and topped with tiny gold and pink paper crowns according to the birthday girl’s wishes. Trays of fresh fruit glistened on wooden skewers like fairy wands, light pink punch sparkled through the beveled glass, fluffy marshmallows dipped in rich white chocolate and drizzled with sprinkles. 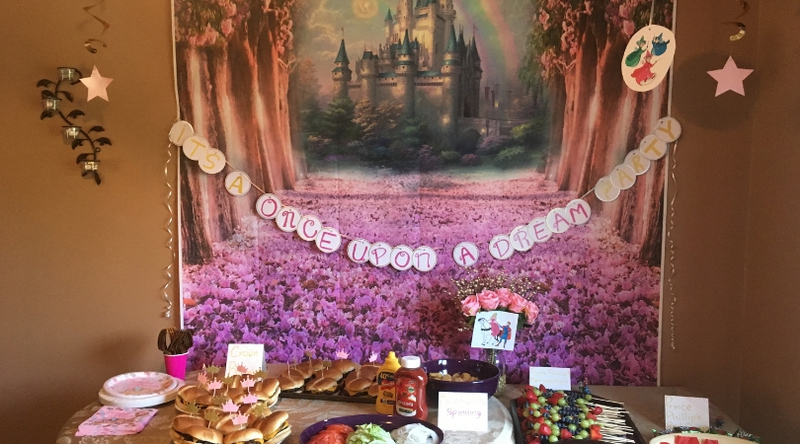 A silver castle surrounded by pink and gold blossoms adorned the wall, while fairies floated in the air and gold lettered signs glittered on the serving tables. White and pink roses stood gracefully in shiny gold jars with pictures of Aurora and her prince peeking out of the petals. The pink dress of Aurora matching the pink dress enveloping the birthday girl in folds of tulle. She twirled among her guests with unchecked excitement and led them in a exuberant game of whacking the flower pinata outside until they were showered with candy and trinkets. 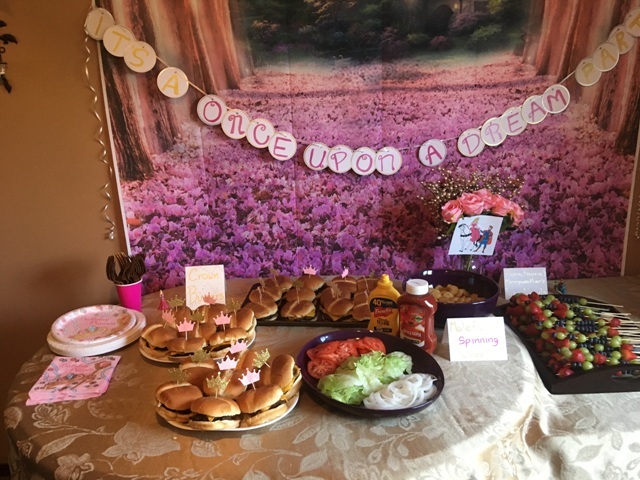 It was the “Once Upon a Dream” party, my six-year-old princess had wished for. 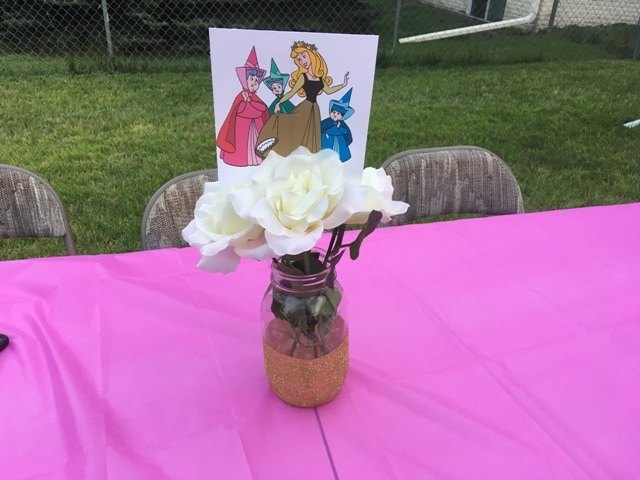 To throw a lovely Sleeping Beauty birthday party themed just like this one, here is all the information you need to make it happen! Most of the decor items are from Party City or Amazon. The Sleeping Beauty birthday party invitations were from Zazzle. 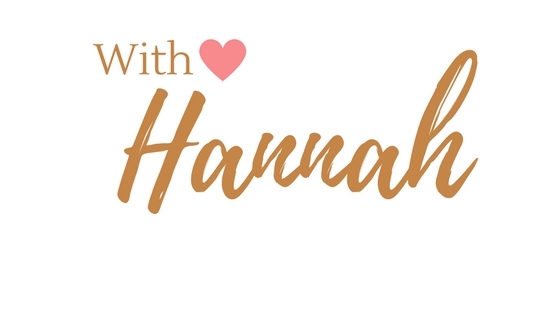 A simple search will bring up all kinds of invite design options and for thank you notes I just printed off a picture of the birthday girl from the party to include in generic thank you note cards I already had on hand. +Crown burgers: Just your basic grilled burger with all the fixings, topped with toothpick paper crowns. 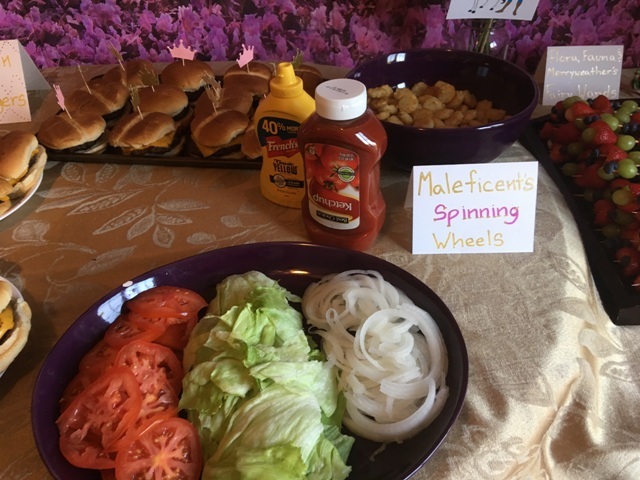 +Maleficent’s Spinning Wheels: Frozen tater tots heated up in the oven. 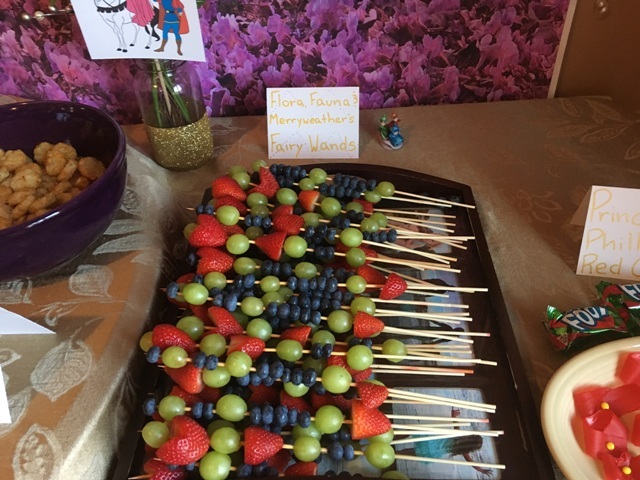 +Flora, Fauna and Merryweather’s Fairy Wands: Strawberries, blueberries and grapes stuck on wooden skewers to resemble wands. The red, blue and green fruit colors were purposely planned to coordinate with the three fairy’s costumes from the fairy tale. 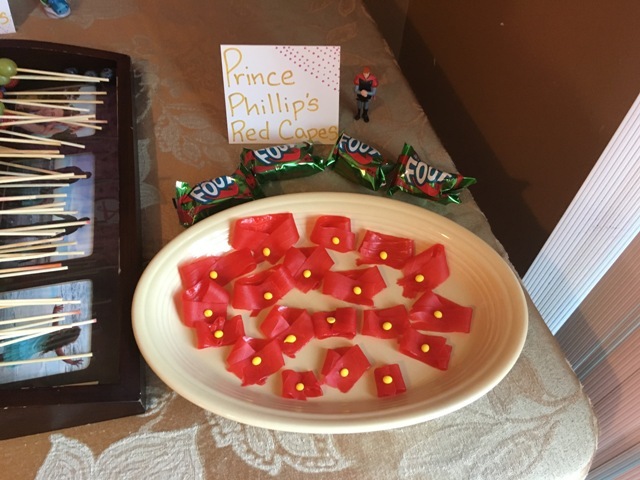 +Prince Phillip’s Red Capes: Red fruit rolls ups cut in half and folded over to look like a cape. Stick yellow button candy on top to complete the look ( I bought this button candy at Party City. +Sleeping Beauty’s Fluffy Pillows: Marshmallows dipped in melted white chocolate and sprinkles. 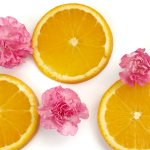 Stick into wooden skewers and let the finished creations dry on wax paper. 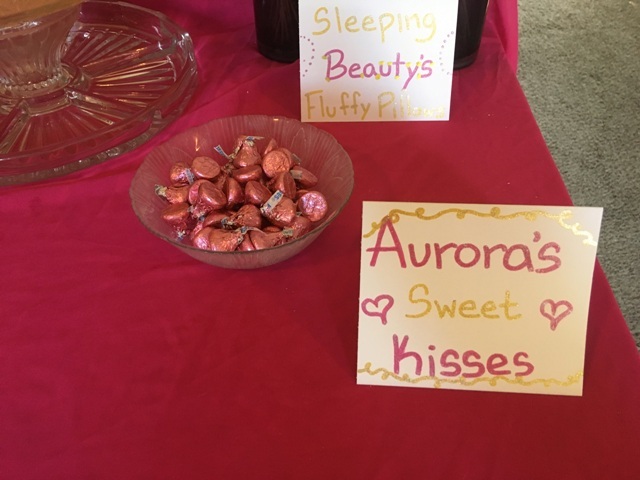 Aurora’s Sweet Kisses: Pink chocolate kisses in a bowl, also from Party City. 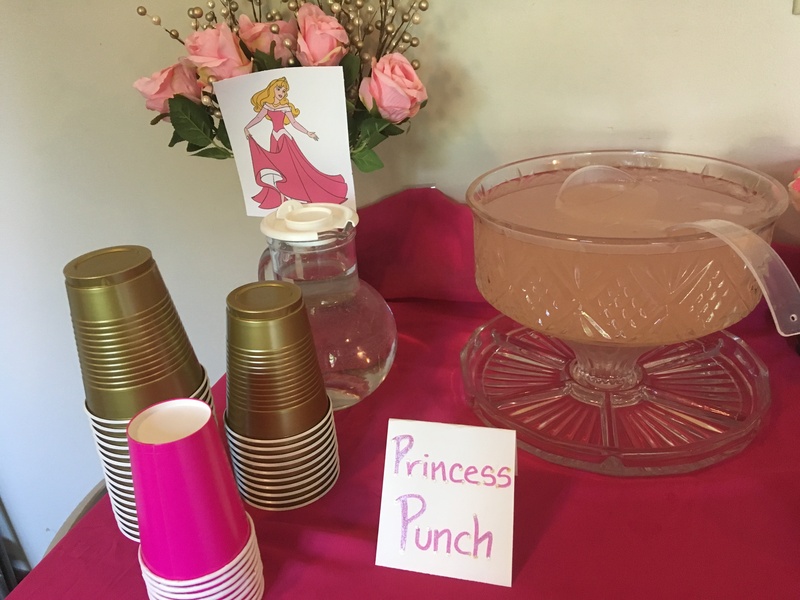 +Princess Punch: I used this recipe although the recipe picture looks much more pink than mine. I’m not sure if it was because I used Minute Maid lemonade cans instead of the pink lemonade frozen concentrate? You might want to do a test run first to make sure your punch is pink enough. +Pink Strawberry Cake: Strawberry cake mix with pink frosting and sprinkles and a gold “6” candle. I also bought ice cream to go with the cake and made an additional “funfetti” cake mix to give the guests a variety to choose from. +Pink princess tableware settings with pink and gold cups and gold forks and spoons. +Tablecloths: Gold fabric tablecloths and pink plastic tablecloths for the tables. 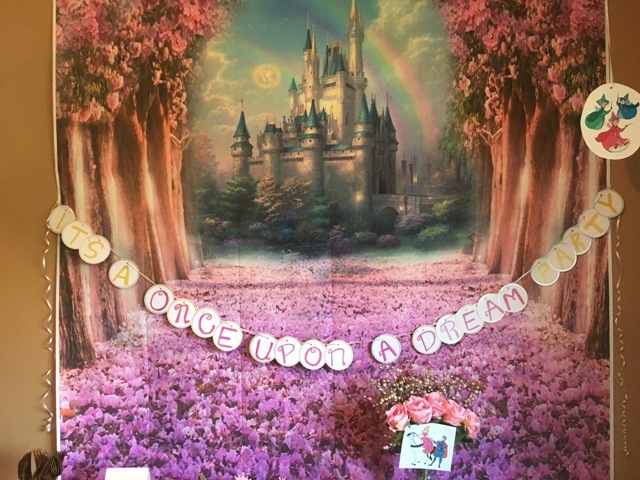 +Fairy Castle Backdrop: I bought this piece on Amazon and attached it up on the wall with thumbtacks. 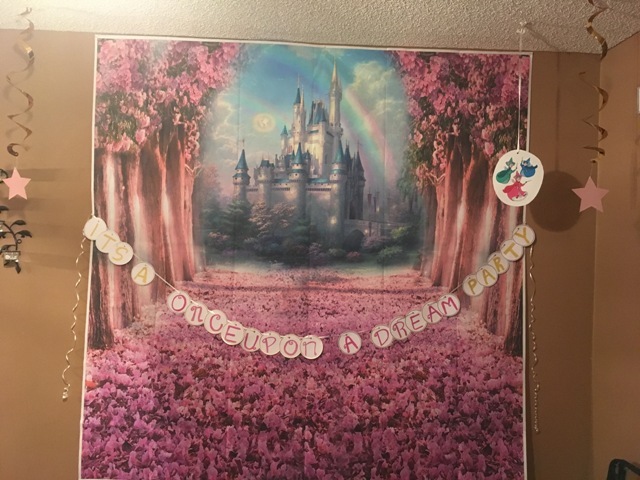 It worked wonderfully as the main decoration for our Sleeping Beauty birthday party. It now doubles as a decorative wall piece in the kids’ princess bedroom. +Once Upon a Dream Sign: I created this with gold and pink glitter markers from and wrapping paper tags from Target. I punched holes in each circle tag and strung up with white ribbon and thumbtacks. +Food Signs: Using white card stock and the same pink and gold markers I decorated the little food signs for the serving tables. +Centerpieces: White and pink silk roses in gold painted mason jars: My sister in law actually made these so I just borrowed them and added the roses. She told me she used masking tape to create the edge, painted Modge Podge glue onto the jars below the tape and then added gold glitter. 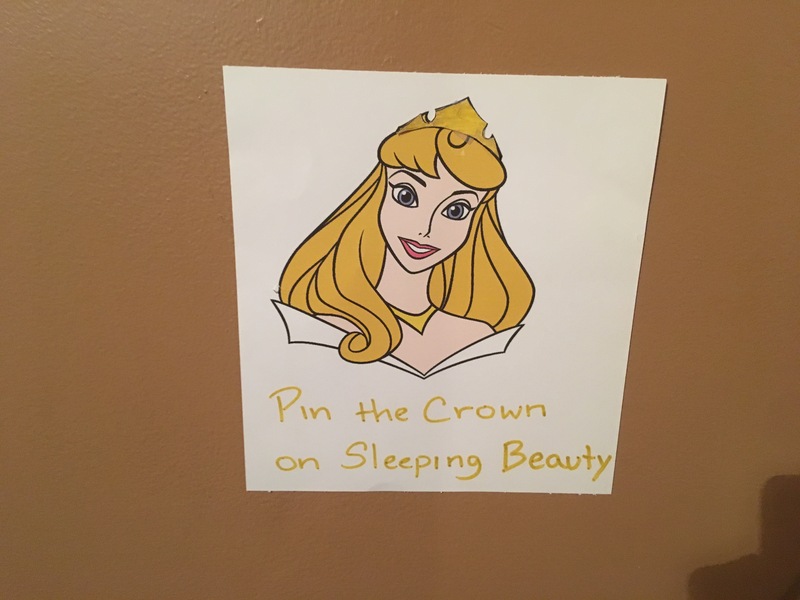 +Sleeping Beauty Character Cutouts: I found these on a free Disney clip art site. 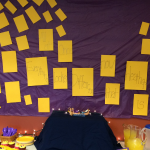 I cut them out to hang with ribbon from the ceiling, decorate the top of the cake and stick in the flower jars by taping them onto wooden sticks. +Sleeping Beauty movie Figurines: I found these little figurines on Ebay which double as toys for the girls to keep and play with after the Sleeping Beauty birthday party. +Balloons: Gold and pink balloons ordered from Party City. 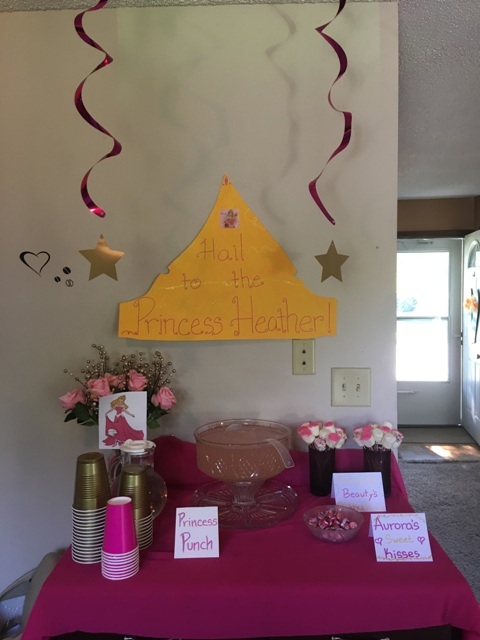 +Gold Crown: I traced and cut out a gold crown from yellow poster board and added marker designs and words that read” Hail to the Princess Heather”. 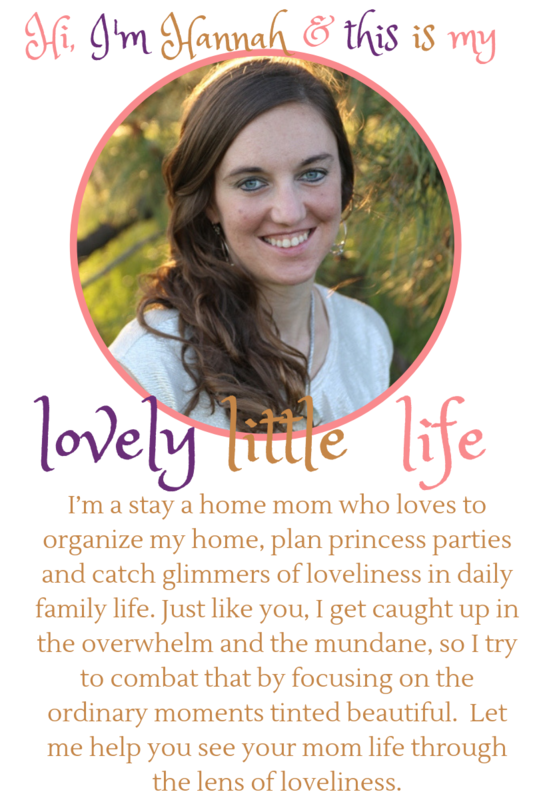 A spin off of the traditional Princess Aurora song from the Disney movie. Flower Pinata or a Castle Pinata. (We chose the flower because we found it while browsing party city and that’s what my daughter wanted. 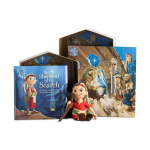 I was originally planning to get a castle one). Fill with pink chocolate coins, pink chocolate kisses, plastic jewelry, fairy wands, kazoos and other trinkets from the Dollar Store or Party City. I also bought little white favor bags so the kids could take all their collected treasures home. 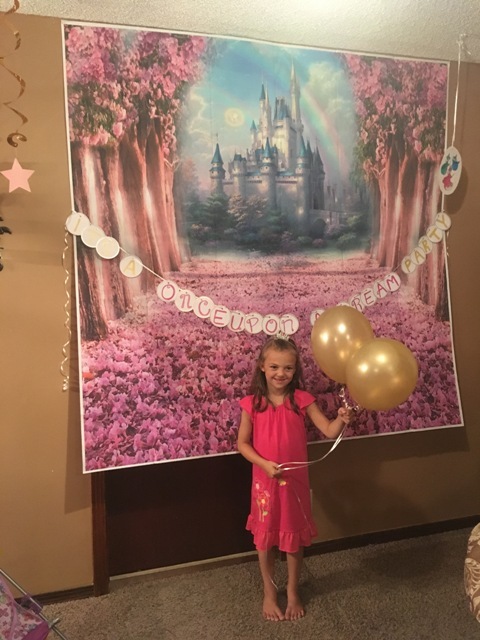 Pin the Crown on Princess Aurora. 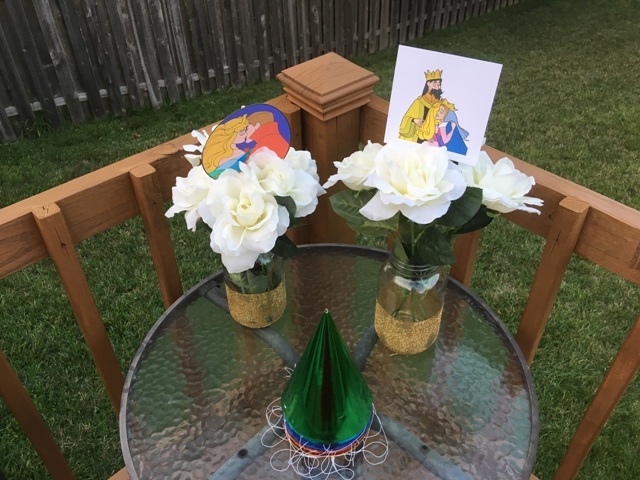 I printed this picture from Disney Clip Art and then traced the crown with yellow paper and cut a bunch of them out for all the kids. Crown Craft. 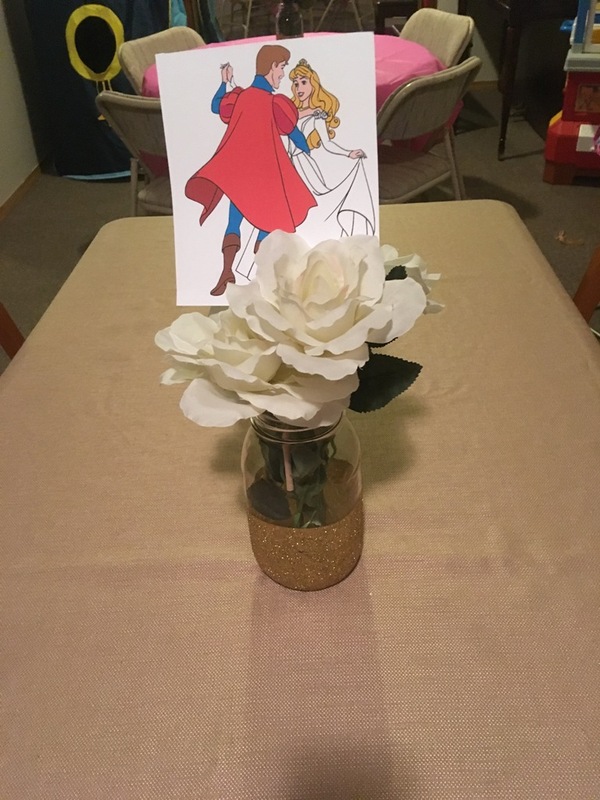 I didn’t actually end up doing this for our Sleeping Beauty birthday party but it was another fun activity I found when I was brainstorming ideas. 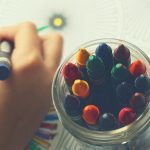 If you’ve read through any of my previous party planning posts, you know that my daughters like to dress in character for their parties and they usually encourage the rest of the family to join in matching costumes. We usually recycle the costumes for Halloween. 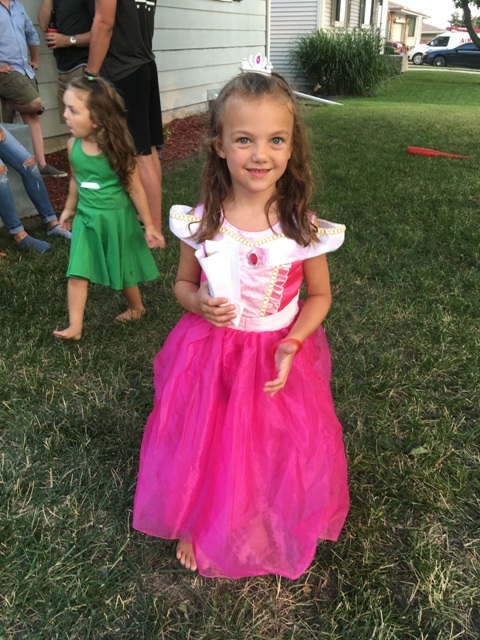 For the Sleeping Beauty birthday party, the birthday girl was Princess Aurora, of course, with a pink dress and Daddy was Prince Phillip. I was going to have him wear a red cape I had made for a previous party with a blue shirt and jeans. He didn’t end up wearing it that day, I think he forgot and I kinda forgot to remind him. He is, however, wearing the costume for Halloween. Mommy and the two younger sisters came to the party as the three fairies. Flora in red, Fauna in green and Merryweather in blue. I bought simple solid colored dresses on and matching fairy wings online. We attempted to wear matching colored party hats too but they did not stay on very well. Either way, it’s fun to get into the spirit of the party and to have our family Halloween costumes planned early! 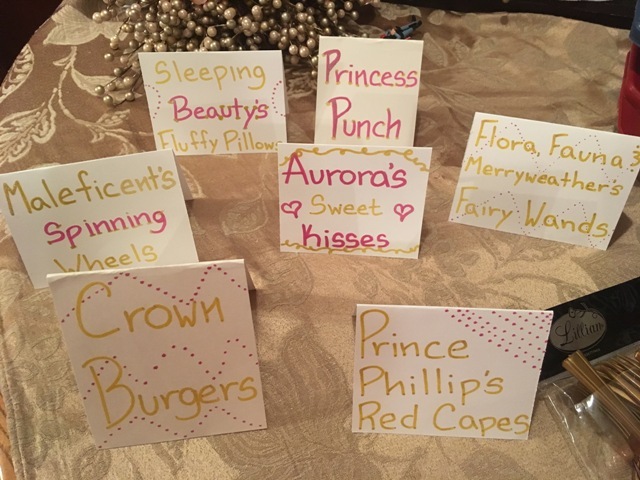 Here are the previous princess parties I’ve planned.